Pastor Catharine Cummings is a native of Memphis, TN. She was licensed to preach and later ordained under the pastoral leadership of then senior pastor Dr. Frank A. Thomas and associate pastor Rev. Virzola Law at Mississippi Boulevard Christian Church (Disciples of Christ). 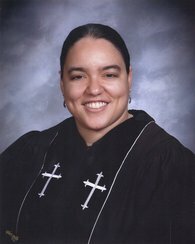 Prior to Wesley, she served as a pastoral resident at Union United Methodist Church in Boston through the Transition into Ministry Program funded by the Lily Foundation at Charles St. A.M.E. Church (Dorchester, MA). She earned her Masters of Divinity degree from Harvard Divinity School in 2011. Rev. Cummings is the proud pastor of Wesley United Methodist Church since February 2013. Wesley United Methodist Church is a "Matthew 25" church with a heart for those who have experienced marginalization of any kind. Under her leadership, Wesley Church sensed God stretching us to nurture a new church plant led by Pastor Nivan Pinto to reach our multilingual sisters and brothers Family Brazilian Ministry that meets in our Chapel. Pastor Catharine is grateful to be growing in God’s grace with God's people. We are thankful for the ways God continuously provides for our faith community. We strive to be the church that "Springfield Can't Do Without" in gratitude for the ways God meets our needs. She believes God's voice recorded by the prophet Jeremiah, "For surely I know the plans I have for you, says the Lord, plans for your welfare and not for harm, to give you a future with hope" (Jeremiah 29:11, NRSV). As believers in God our Creater, in Jesus Christ our Redeemer, and the Holy Spirit who is our Sustainer, Rev. Cummings knows that the best is yet to come! Pastor Catharine is the second daughter of Evelyn and John Cummings and has two sisters, Constance Gipson and Carolyn Cummings. A God-send to her family is Saint Michael from Roxbury, her precocious feline friend, who keeps her on her toes every day. She also serves as Religious Coordinator (i.e. : Chaplain) with the Hampden County Sheriff’s Department.